This is the first in an occasional series of customer profiles. 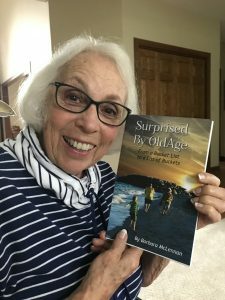 A Powerful Story just helped Barbara McLennan, age 80, publish a book. skeleton of copy in hand when she started with me, she was artfully helpful in the actual writing, then editing and sequencing the chapters. Barb McLennan has always loved writing, especially poetry. Her annual Christmas letters always contained family updates captured in verse. 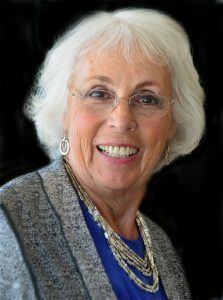 A few years ago, she reconnected with one of her husband’s college friends, Dr. Arthur Ammann. Dr. Ammann was working on a book, and needed an editor and collaborator. In her 70s, Barb’s long-time dream of writing a book came true. (In)Visible: From Obscure to Valuable released in 2014, and publishing it taught Barb a lot. A Powerful Story played a small role in that project, when Barb and Art asked Keri to read the manuscript and offer suggestions and edits. The experience stirred in Barb a desire to write a book on her own. Barb’s 80th birthday came this year, and with it, a strong desire to make her book a reality. The idea for her book grew out of her experiences. As she and friends grew older, she kept finding herself surprised by the aging process, which brought challenges and feelings she’d never anticipated. She was surprised by the way age, and all of its attendant challenges, crept up on her. When she talked with friends, her working title of “Surprised by Old Age” resonated deeply with almost everyone. She began writing a few poems, and then asked friends to contribute essays, thoughts, and poems to add to the book. She collected newspaper articles, quotes, and stories. Barb contacted Keri at A Powerful Story to ask for help in transforming her collection of essays and poems into a published book. We were excited to help Barb make her publishing dream a reality. Our publishing services began with an assessment of Barb’s manuscript, which although she’d been working on it for a while, was still a bit short to be a full-length book. We sorted through her file folder of quotes, stories and articles. We provided advice and guidance as she expanded the manuscript and added more chapters. Our next step in the publishing process was a developmental edit, in which we helped shape the overall flow of the book. Barb had a clever hook with the idea of different “buckets” to describe various situations in old age, and the book included a chapter about the movie The Bucket List. We provided creative consulting on the subtitle, suggesting “From a Bucket List to a List of Buckets” which indeed became the subtitle. We rearranged chapters, figured out a structure and flow for the book, and helped her decide what to add, rewrite or eliminate from the manuscript to make it as strong as possible. Copy-editing came next, as our editing team carefully checked sentence structure, punctuation and grammar.Our publishing service includes checking citations, making sure all footnotes and citations were correct and followed copyright regulations. The book contained not only original poems and essays but quotes from a variety of sources. Next, the Powerful Story design team went to work, designing the interior pages, formatting the book for print and ebook formats. Barb’s son Todd, of Todd McLennan Photography, stepped in to design the cover. We wrote back cover copy and made sure everything was perfect on both the exterior and interior of the book. Barb was delighted with her book. Finally, the book was ready to print and be published. Our favorite digital printing company, Copresco, printed digital copies of the book. Barb loved the results. At the same time, we helped Barb set up an account on CreateSpace, Amazon’s self-publishing platform, as well as Kindle Direct Publishing. We put both an ebook version and a print-on-demand version on Amazon. See it here. Barb’s project reminds us that it is never too late to follow your dream of writing and publishing a book. Please click to contact us for a free consultation.